Duty rigs have changed a great deal since I entered the police academy in 1993. Shiny patent leather and laminate holsters are still popular, but nylon has made big inroads. Users of striker-fired pistols should avoid non-reinforced nylon holsters and thumb breaks. Non-reinforced nylon is too soft, and in most cases the holster mouth is devoid of structure, preventing easy one-hand reholstering. 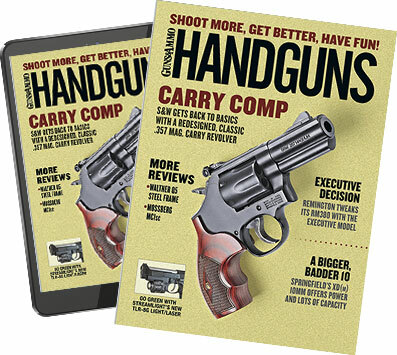 Thumb breaks are prone to catching in the trigger guard during re-holstering. Weapon retention is the key consideration when selecting a duty holster. Level I usually consists of nothing more than a simple thumb break. Level II relies on a thumb break or a roll top and a simple motion to release. Level III holsters have three separate safety features. Odds are your department will mandate a particular holster. If not, most users will find Level II offers the best balance of draw speed and weapon retention. A good holster must be made for your pistol. Generic, one-size-fits-many models don't do a good job of retaining your pistol and are generally not very comfortable. A good holster should be molded tight enough to retain your pistol without straps or tension screws, and it should cover the trigger guard. It should also have a reinforced mouth that keeps the empty holster open for easy one-handed re-holstering. The holster's belt loops or slots must match your belt so the holster stays put for all-day comfort and a sure, speedy draw.